Experience the LARGEST and FINEST selection of seafood on the West Coast! Priding ourselves on the largest selection of live seafood on the West Coast, Quality Seafood is a unique dining experience. Take it to go to fix at home, or have us cook it for you. Everything can be cooked and eaten onsite. So come down, lay out some newspaper, crack some crab and enjoy a beer. There’s no place like it! California’s 2017 Dungeness Crab season opens November 15th! We’re looking forward to our first shipment of tasty crab from beautiful Half Moon Bay, Ca! Up North the opening of Dungeness season is timed perfectly with the Thanksgiving holiday, as a result it’s a tradition to have a little Crab on Turkey Day and throughout the week. 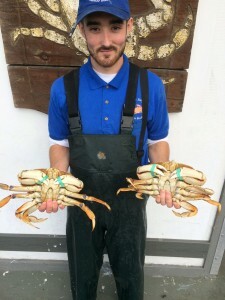 While our roots here at Quality Seafood are deeply planted in the South Bay, recently relocated family from the Half Moon Bay area have been more than a little giddy about getting some tasty crab to take home on Thursday. Speaking of Thanksgiving, as always we ARE open until 5pm, we’re open regular hours Friday through Sunday, and we’re ready to have you start your Thanksgiving Dungeness Crab tradition with us. Dungeness Crab is currently $12.99/lb (our lowest price since March) and we certainly hope to see that price drop in the coming days to make your meal not only tasty, but more affordable too. We carry a bounty of fish at Quality Seafood. Here’s just a small selection of what we typically carry. The Crab Pit is Quality Seafood’s live crab and shellfish area. It’s the largest department here with the largest selection of live shellfish on the west coast. Your meal at Quality Seafood isn’t complete without your drinks and condiments. All this, and much more, can be found in our Beer & Wine Department. Take a tour of Quality Seafoods, and then come visit us!